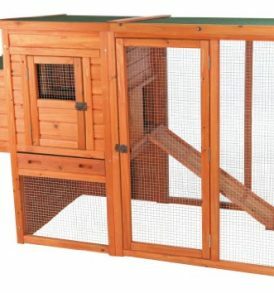 Your rabbits will love its brand new outdoor Pawhut rabbit hutch. 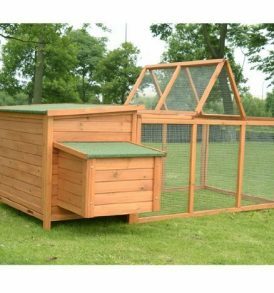 This large wooden hutch contains two long runs on each side of the main house so your bunnies can enjoy the outdoors with the grass between their toes. Two ramps connect from the house to give your pets easy access to the indoors section. 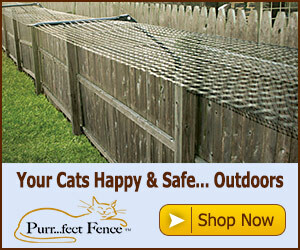 The treated wood allows great ventilation while also giving your pet insulation for the colder nights. There is an easy access door on the front of the hutch while each run has a door on the end so you can quickly take out or store your pets. Below the front door/window is a pull out droppings tray so you can easily clean out the bottom of the house. 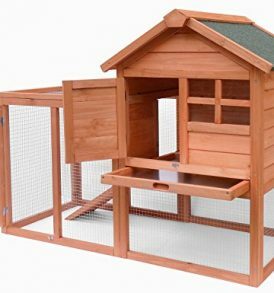 Give your pets the house of their dreams with this Pawhut rabbit hutch. .